Describe two use cases for validation rules. List the elements of a validation rule. Validation rules verify that data entered by users in records meet the standards you specify before they can save it. A validation rule can contain a formula or expression that evaluates the data in one or more fields and returns a value of “True” or “False.” Validation rules can also include error messages to display to users when they enter invalid values based on specified criteria. Using these rules effectively contributes to quality data. For example, you can ensure that all phone number fields contain a specified format or that discounts applied to certain products never exceed a defined percentage. You can create validation rules for objects, fields, campaign members, or case milestones. In these steps, we’ll create a validation rule that fires when a user tries to save an account with an account number of incorrect length. From Setup, go to Object Manager and click Account. In the left sidebar, click Validation Rules. Error Message: Account number must be 8 characters long. To check your formula for errors, click Check Syntax. 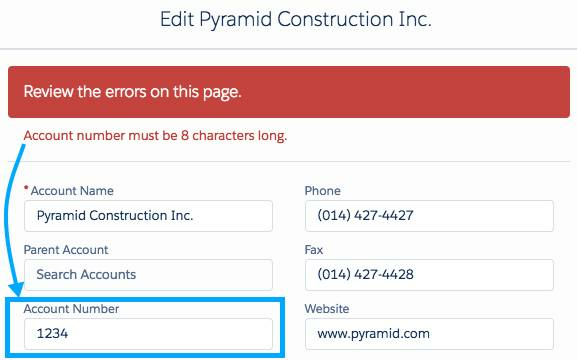 Here’s how a validation rule’s error message can appear when a user types an incorrect phone number format into a field. Description: Validates that the Account Number is numeric if not blank. Error Message: Account Number is not numeric. Description: Validates that a custom date field contains a date within the current year. Error Message: Date must be in the current year. Description: Validates that the range between two custom fields, Salary Min and Salary Max, is no greater than $20,000. Error Message: Salary range must be within $20,000. Adjust the Salary Max or Salary Min values. Description: Validates a custom field called Web Site to ensure its last four characters are in an explicit set of valid website extensions. RIGHT( Web_Site__c, 4) <> ".net"
Error Message: Web Site must have an extension of .com, .org, or .net. Description: Validates that the account Billing Country is a valid ISO 3166 two-letter code. Error Message: A valid two-letter country code is required.